So much talk about social media. It can’t be ignored by firms who want to find more effective ways to market. Everywhere pundits are saying that advertising, as we know it, is dead. That social is the next thing. If we create an environment or community where customers can help each other and in the end your product, you will save money and get great ideas. Win, win. But how? Senior executives of companies are understandably shy about going all in on this social thing. They see it as a potential loss of control. As a strategy that could easily backfire. Customers may say bad things about their products or company that just aren’t true. In some cases the customers may have an irrational grievance, or just didn’t understand something. Happens all the time. It’s happening right now in social networks everywhere. That’s the point. It happens and we don’t pay attention. It’s dead simple. Firms that don’t participate will fall behind the ones that do. I came across Ross Mayfield’s Weblog the other day. It’s really good. 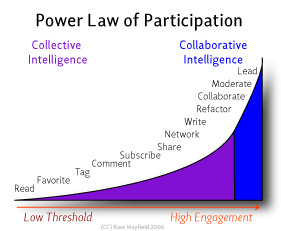 He posits a concept called the Power Law of Participation, and illustrates it nicely in this graphic. The tail defines the low threshold activities and represents the network’s Collective Intelligence. The community identifies their likes and interests. Some of this is tracked by web analytics tools inside companies, or on broader site-spanning networks, while others manifest themselves in the communities at large in the form of links, videos, posts and subscriptions. Once an individual or ideally individuals (and lots of them) reaches collaboration, moderation, and leadership, they are in the high engagement category of Collaborative Intelligence. They process what the low engagement citizens are doing, sharing, and subscribing to, then take it up several levels. Potentially all the way to the point of producing content, even product ideas. This principle maps nicely to Forrester Research’s Ladder of Participation concept of Internet users. We know that Google allows their engineers to spend 20% of their company time on pet projects to help foster innovation. Now that is a scary thing for mainstream company executives. And it has been said that Google is the best beta company ever, but they need to finish some things in order to grow up. There is certainly proof they have done both. Eric Schmidt, Google’s CEO has said. Virtually everything new seems to come from the 20 percent of their time engineers here are expected to spend on side projects. They certainly don’t come out of the management team. This gives us a different way to think about social networks. As an equivalent to the 20% Google grants it’s employees, except much better. Firms should start off by working the tail of Mr. Mayfield’s Law of Participation, by leveraging content they already have, or can aggregate without much effort. This will pull consumers to their site. Further up the curve it will be necessary to create influencer marketing programs that will push vs. pull. No one can say for sure where it will go, so trying to have a 5 year strategy doesn’t make any sense. Most companies don’t have the skills in house right now anyway. By developing strategies and campaigns for each phase of this curve, companies can begin to shape and measure the practice of Social Influence Marketing. It’s a convergence of publishing, product development and service in a social network of prospects and customers. More to come.